IETF's RFC 791 lays out Internet Protocol version 4 (IPv4) which assigned publicly accessible machines 32-bit addresses. Those addresses - commonly referred to with the shorthand IP Addresses - can "only" address a maximum of 2^32 or 4,294,967,296 devices. While 4.3 billion addressable endpoints was once sufficient, the explosion in popularity of the internet (and recently, internet-connected devices) means that IP address exhaustion is inevitable. Compounding the issue, IPv4 addresses were assigned in very large blocks at first, so many IPv4 addresses are effectively unusable for current devices. While Internet Protocol version 6 fixes the issue with 128-bit addresses (read: 2^128, 3.4e38, or more than the number of atoms in the universe) it isn't yet universally implemented. NAT has become synonymous with the concept of IP Masquerading, where the true source or destination address of a packet isn't what's listed. Analogous to a community mailbox, IP Masquerading can allow a single gateway device such as a router to sit in front of a network of dozens - or in some cases, millions - of computers on a private network. That single gateway will forward the packets on to the actual destination. The router will usually have the only publicly accessible IPv4 address in the house while other devices are masqueraded using Network Address Translation. NAT on a large scale means that ~4.3 billion IP addresses have sustained IPv4 past 4.3 billion internet connected devices. However, it has introduced a number of complications - and at some times showstoppers - when dealing with routing. When a device is the recipient or initiator of a communications session (such as with SIP), it's very likely the device does not have a publicly accessible IP address. Twilio has deployed a number of services to avoid the complexity of NAT for your business communication needs. 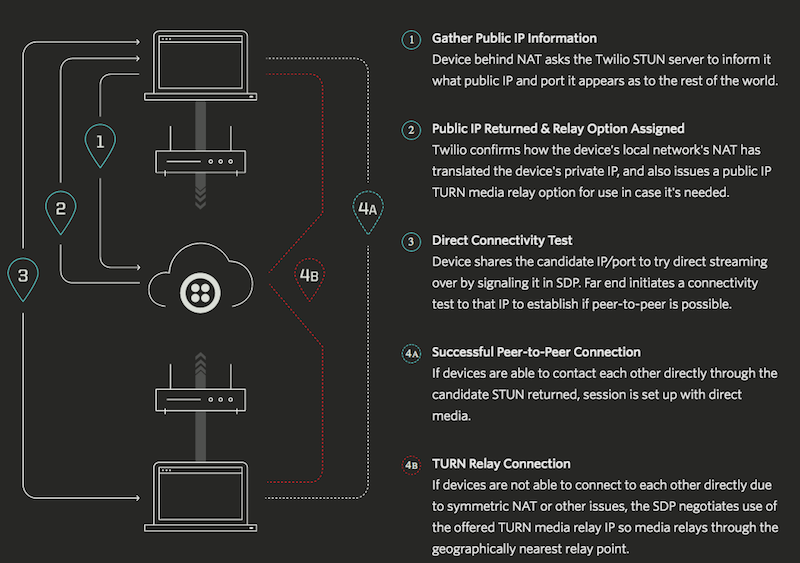 Using STUN - Session Traversal Utilities for NAT - and TURN - Traversal Using Relays Around NAT - Twilio can route around any NAT traversal complexities when establishing peer to peer connections. STUN allows a host to discover its publicly accessible IP address while TURN will relay an incoming connection to a NATted device. Twilio's Network Traversal Service is a globally distributed media relay service to improve the reliability of your peer-to-peer communications. We perform STUN lookups for you, and if STUN is insufficient to make a peer to peer connection we automatically provision a TURN Media Relay point in our global network on your behalf. You can help your internal workflow by ensuring geographically diverse sites have more reliable peer to peer connections. You can improve global service and support for your WebRTC applications. Whatever your need, Twilio has your back - read about our Network Traversal Service, dive into the docs or talk to sales today.